It is with a heavy heart that I am sharing the most devastating news with you. Dr. Carolyn Bremer passed away unexpectedly on the evening of Sunday, September 2. Carolyn was an amazing person who made our conservatory the center of her life for many, many years. Her passing leaves a gaping hole right in the center. She was an incredible chair, director, and mentor to me, personally. She touched so many lives with her compassion, positivity, and sense of humor. Carolyn playing just a fraction of her singing bowl collection at the BCCM. It is easy to regard Carolyn Bremer as a "one hit wonder." Early Light is a mainstay in the wind ensemble repertoire. The original version for orchestra has been performed by the Houston Symphony and California Philharmonic among others. The wind version has been performed at Carnegie Hall, the Kennedy Center, for the 150th anniversary concert at WestPoint, and by the President’s Own Marine Band on the steps of the U.S. Capitol. It is recorded by over a dozen ensembles including the North Texas Winds and Heritage of American Band. Tibetan Singing Bowls play an ever-expanding role in Carolyn’s musical life. She and several colleagues perform interactive concerts in which the audiences listen to and then play the bowls. Singing bowls have informed her understanding of the experiential listening process and have led her to study the interaction of spacious, meditative listening, and composition. Other occasionally obsessive interests include landscape and concert photography, fountain pens and too many colors of ink, and just about any gadget made by Apple. Carolyn Bremer has been dubbed a composer "driven by hobgoblins of post modernist cant." She came to composition on the heels of intensive training as an orchestral bassist. She studied at Eastman, CalArts, and received the Ph.D. from UC Santa Barbara. Carolyn was Chair of Composition at the University of Oklahoma from 1991-2000 where she held the O’Brien Presidential Professorship. 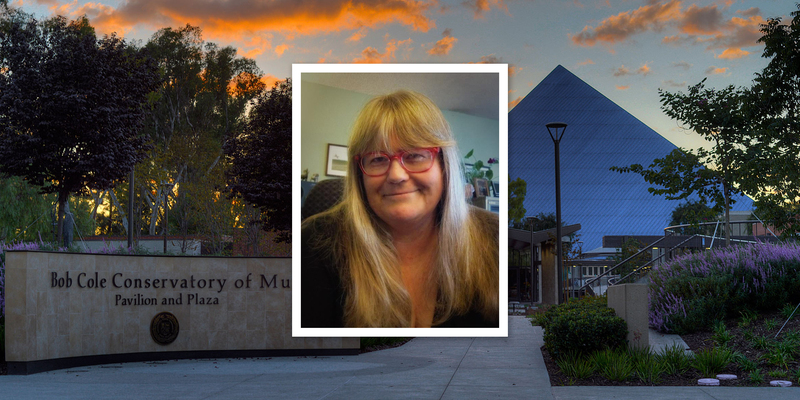 Currently, Carolyn is Associate Director of the Bob Cole Conservatory at Cal State Long Beach: she immensely loves her job. Please join us for a celebration of Carolyn’s life on Friday, September 21 at 10:00AM in the Carpenter Performing Arts Center. The memorial will include musical performances by the Bob Cole Conservatory of Music community. There will be a reception immediately following the event on the patio in front of the Daniel Recital Hall. All are invited to attend to help us say farewell to an incredible human being. Please see maps and directions below. 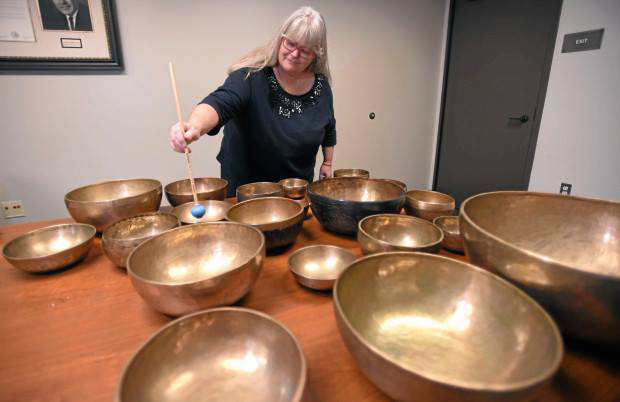 We will be ringing Carolyn’s Tibetan singing bowls for approximately 60 minutes in the Daniel Recital Hall. We invite you to silently meditate with us for as long or as briefly as you would like.